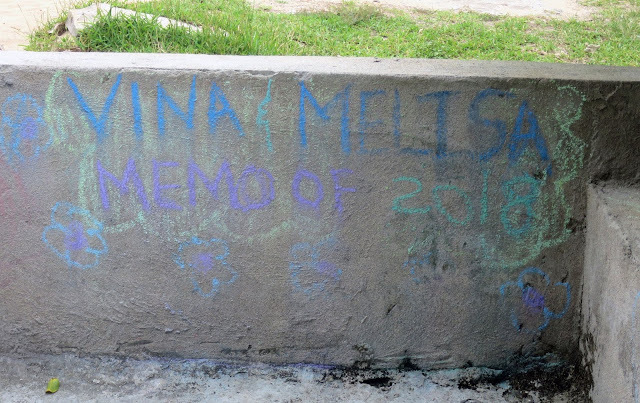 "Vina & Melisa: Memo[ry] of 2018"
I first met Vina in December 2017, at the end-of-year teachers' closing celebration. It was a small dinner with the teachers, staff, and family. I'd never met her before, but she happened to be in town that weekend. She easily struck up a conversation with me, and she had tons of questions. In this culture, children are often shy. Vina is shy in her own way, but one-on-one, she'll unload questions on you in Bislama. "Yu blo wea? Yu bin go lo Hollywood finis? Yu bin luk Taylor Swift finis? Ariana Grande? Yu bin go lo hamas kantri?" Where are you from? Have you been to Hollywood? Have you met Taylor Swift? Have you met Ariana Grande? How many countries have you visited? Each of your answers will light her spark to ask a thousand more questions, and it's a delight to see her reaction to them. If you ask her questions about herself, she'll be modest, dismiss her life as boring, and ask you more and more. When I finally got a chance to ask her about herself, I was confused at first, because she told me Mrs. Nasse was her "mami" which is what you would call your mother...but in this case, she was referring to her aunt. I saw her that day, spent a lovely night getting to know her, but she revealed she schools in Port Vila, and I then knew that I'd probably never see her again. The end of December 2017 came and went, as did January 2018, and then the 2018 school year began. And there she was, at the headmaster's house. It's common for family to stay in their relatives' homes while attending school in other villages, and here Vina was, ready to complete 8th grade at Eles School. I remembered her as that flash of a conversation back in December, and she remembered me as the white girl at Eles. It's hard for a female PCV/outsider to befriend the young community here (many PCVs have stated, quite accurately, that your friends will be grandmas and children). With such strong gender roles, women between 15 and 35 are often away at school or at home with their own children. It's hard for an American like me to relate to a 25 year old who already has three children and is in a completely different life stage. I yearned for a connection to anyone young. I'd like to say Vina grew to be a friend, but I think the reality of it was that we both just wanted friendship and it happened. It's hard to summarize a friendship and how it develops. Little moments come together like blades of grass on a lush green field. Vina loves music and dancing, and I love teaching her new choreography. We tried (and failed) to do yoga together. She tried to get me to play volleyball, but I am too sedentary. We made perfume and colored together. I showed her how I cooked, and she schooled me in scratching coconuts (I didn't really learn...she's still a thousand times faster). I taught her how to sew. We watched movies together (she especially liked musicals or ones about teenage bands). I bought her magazines in Vila with pictures of her favorite singers. We swim in the ocean at night, her sharing her concerns about the girls at school as I told her, despite our cultural differences, it's quite the same in the USA. I loved getting close enough to someone to talk about puberty and all the body stuff a girl deals with at this time in their lives, and she was caring enough to listen to my advice. She is extraordinarily curious, and she isn't afraid to ask questions and learn. She is hungry for information, memorizing the flags of the countries in her atlas or asking about English slang in her favorite songs. Even in the quiet moments, she stares at me, as if she's trying to read my mind or learn something more without the effort of using her voice. She's fun to be around, and it's not that kind of boisterous laughter, giant energy kind of fun, but rather a quiet enjoyment. She's comfortable to be around. Needless to say, I've grown close to Vina. It was only a matter of time before she graduated 8th grade at the end of 2018 and had to move on to 9th grade elsewhere. As the school year drew to a close, I was consciously aware of the fleeting moments we had left. The school closing ceremony and graduation celebration was on December 4th. On December 3rd, I learned that Vina would be departing for Vila after the celebrations. Just after a short time in Vila, she was to fly to Tanna to celebrate Christmas and New Year's, and then she'd be off to school on another island. After the chaos of running around all day, taking pictures of the ceremony and helping teachers print out last-minute certificates, the ceremony ended, and that was it. Vina already had her bags packed, and while still wearing her graduation dress, she was lugging her stuff down to the beach to load up the boat to head to Efate. Her other cousins, Laura, Job and Jameson too were leaving, not to come back. While island time is very real, there is also a habit of swift departures that can make it hard to make true connections with people here. I didn't hide my emotions. I was heartbroken to lose a friend. I cried and cried as I hugged them all. 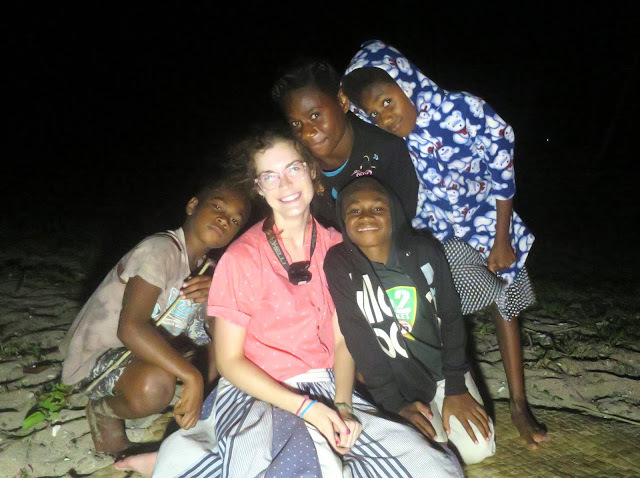 In Vanuatu, people often will laugh in sad or shocking moments, meaning my tears were responded with awkward giggles from Vina or Laura as they wiped their eyes. I hugged them both, squeezing every last moment I could out of them. We loaded up the boat, and I watched and waved, crying, as Vina and the others pulled away from the shore. That was it. Goodbye. I called another PCV friend of mine, Corley, that afternoon and got emotional. That night, Tuesday, I cried myself to sleep. School was now out, and the quiet made it even more difficult to cope. When there's nothing going on in the village or at school, you can find yourself counting the hours to the next meal or to the next sleep to let the day pass. Wednesday was hard, because the headmaster's house, my only neighbor, was nearly empty. Yesterday, there were 3 adults and 7 children in it, and today, the house had only three people. Thursday dragged as well. I kept busy by inviting some friends from the village to watch a movie at the school conference room with me. Around 3pm, Mr. Nasse's son Marky asked me to step outside of the conference room. There, just outside the doorway, was Vina, with a big grin. I was surprised and confused. Vina explained she just got here on a boat with her cousin Steven. She told me she was in Vila the last two nights and she, too, was crying herself to sleep. She said she couldn't finish dinner on Tuesday night, lamenting that she was too sad to eat. She told me that as soon as she returned to Vila, she was thinking back on the memories she had on Nguna, with her friends at school, and with me. I hugged her. That night, we went for a walk on the beach. I asked her when she was leaving again, and she didn't know. Plans kept changing. Her mom works on a cruise ship, and hadn't yet returned to Vanuatu. Plans hinged on her mom's arrival, so instead of going to Tanna, the Nasse family decided Vina would instead go to Pentecost. Vina is from Tanna, but she told me she was excited to go to Pentecost, an island she's not yet visited. 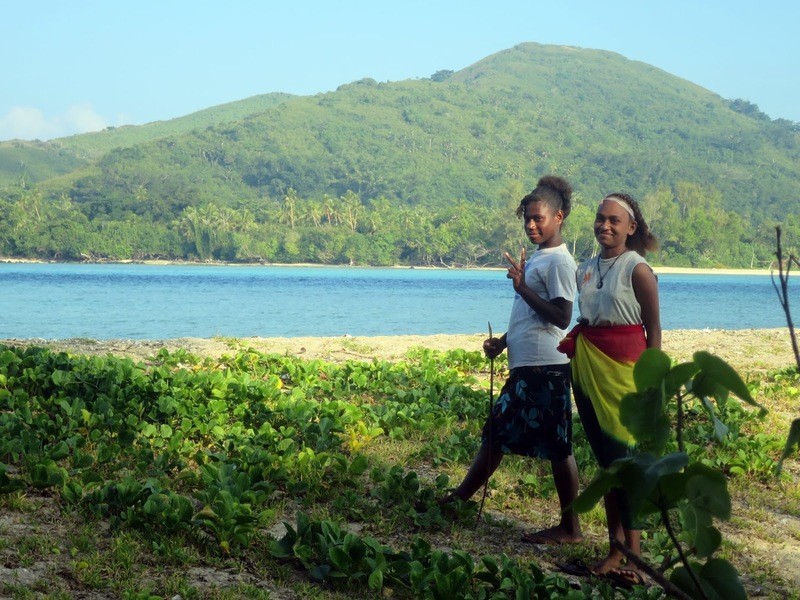 As we walked, the ocean foam licking our toes, Vina told me she was hoping she'd go to school in Aore, near the island of Espiritu Santo, up north. Most students in this area attend 9th grade on Efate, which is a short trip from Nguna, but if Vina went to Aore, I would most likely never see her again. I asked why she'd want to go so far, since people here tend to not want to venture far from family. She told me a cousin of hers attends Aore, and it has a beach. Vina likes beaches. The way graduating year 8 and moving to year 9 is a process for another post, but I will just say that Vina wouldn't know her placement for year 9 until late December or January. She would head off on holiday, unaware of what the future may hold. Vina didn't leave for another full week. It's hard to have two drastically different attitudes pulling you in opposite directions: island slowness and the stress of the last moments you're spending with a friend. She lived right next door, but sometimes days were filled with chores and mundane life instead of hours filled with memory-making material. But I made the most of it, while I could. We played board games that I never got a chance to play with her, mended clothes together, watched episodes of Nickelodeon's Victorious, looked at magazines, and painted our nails. I asked Vina and VV to use some sidewalk chalk to decorate my concrete veranda. I pushed off a shopping trip to Vila so we could lead up to Christmas the American way: making gingerbread houses and watching a slew of holiday movies. I've found here that I do much better with a second goodbye. Leaving for site after three months of training in 2017, I had shell shock as I sat in my house on Nguna, alone for the first time in this foreign place. Going into town for a day trip on the 4th of July to say goodbyes to my fellow PCVs helped put me at ease. When Vina finally left on December 15th, it was much less stressful. I felt that I got a proper goodbye. I calmly waved at her from the beach while the boat pulled away, sad but at peace. In the weeks leading up to my Christmas holiday plans, I looked at the faded chalk drawings not with sadness, but rather a happy calm. 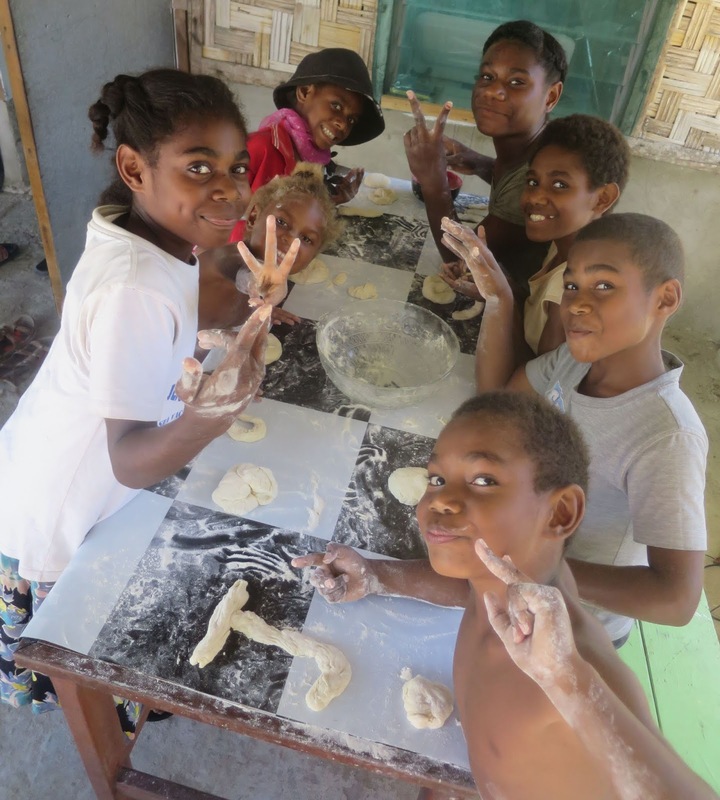 When I returned to Vanuatu from my December travels, I saw on the Ministry of Education's Facebook page (other than radio, this is a valid source of this kind of information) that Vina had passed on to go to Ulei, which is a school in northern Efate (ie, nearby). She would be attending with Job and Jameson, along with my host sister Alice. When I returned to the island just this past weekend, Vina was at the school, here to greet me. I thought I'd never see her again, and here she was. She told me that she'd stay here on Nguna for the next couple weeks before heading off to Efate for the first week of school. She told me that for the 2019 school year, she'd most likely come to Nguna on weekends if and when she was available. I know she can't promise that, and I won't get my hopes up. Here, I just take every moment as it comes.